HI Everyone! So I’m finally getting this kit and mini tutorial posted! YAY! This tutorial is a mini because I will also be providing a video tutorial as soon as I get my camera talking to my mac again and also because I keep forgetting to stop assembling and take pics. So, if you have any questions or need any extra photos - just let me know. 🙂 Click here to purchase the kit! This has been such a fun project and I love all the bright colors but I can see this in softer colors as well. There are really just so many possibilities for layouts, colors, type of card or wall hanging. I have so many ideas and can’t wait to try them out! Let’s get going on the tutorial! To begin with, I used a rounded flap box card pattern from SVGCuts Box Cards Kit. Since I wanted this to have a tropical look, I chose two shades of blue/turquoise for the box card. 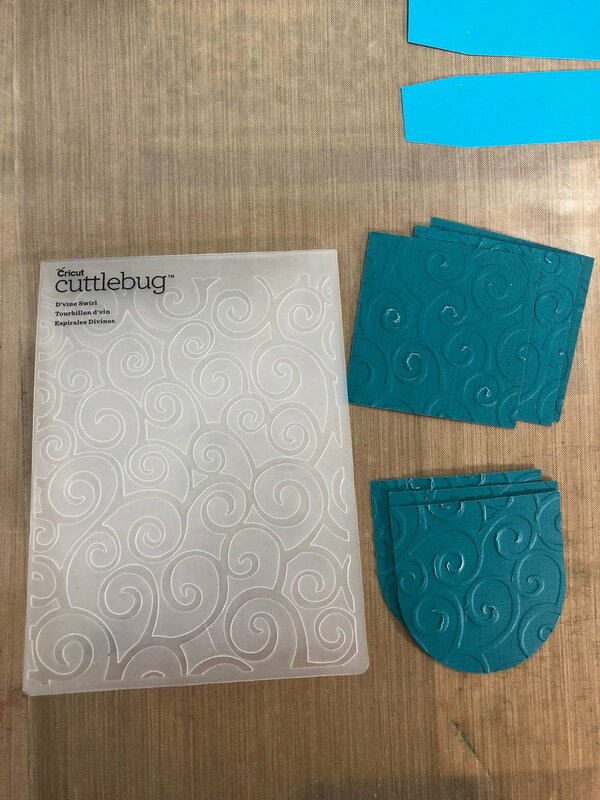 To add texture, I embossed the back and panels with my Cuttlebug D’Vine Swirl embossing folder. Then, to add more contrast I inked over the top very lightly with Tim Holtz Distress Ink. I go back and forth as to whether I want my card back (where you put the writing) to be solid white or to have softer edges. For this card, I went ahead and slightly inked the edges. The paper I used is white core and I don’t like all the white edges showing so I inked those as well. You can also stamp a sentiment here. For the leaves, I inked the edges with Tim Holtz Distress Ink Mermaid Lagoon. It helped to detail the leaves a bit more and give them dimension as well as blend nicely with the blue background of the card. Assembly tip: The darker green leaves with less detail are a background layer for the lighter green leaves. You may need to poke the holes out with a pin. Next, I started assembling the Hibiscus. These are so much fun and have so many different looks to them depending on how you assemble them. For the red one, I inked up the edges with a slightly darker shade of red just to give it depth. Note: it also helps to cover up the white core paper that shows on the edges - as shown in pic below. On the yellow Hibiscus, I wanted more contrast so I used orange to ink the edges. For the magenta Hibiscus, I used blue and this is one of my favorites. In the end, I decided I wanted more contrast on the red one so I inked that one up with blue as well. It seemed to give more uniformity to the flowers in general. 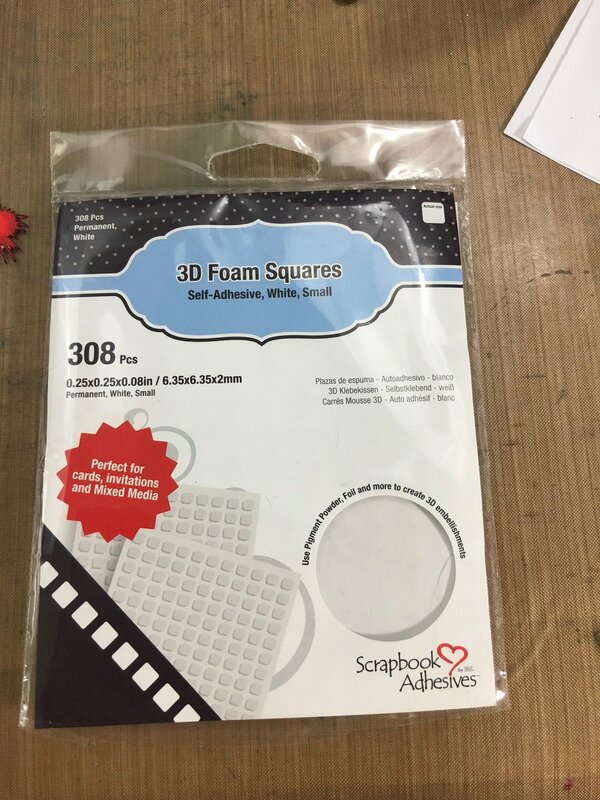 To add dimension, I used 3D Foam Squares I purchased from Amazon. You can put these in between all the layers or just some of them. Just play around with it to see the effects. It’s super cool! You can also just glue down the layers without adding dimension. Another idea is to play around with mixing the colors of the layers. Here are some ideas below that show different colors, layering styles, and inking styles. Now that all the Hibiscus are done, let’s assemble the hummingbird. To give the edges of the wings a little more definition, I very lightly inked them with Tim Holtz Distress Ink Tumbled Glass. 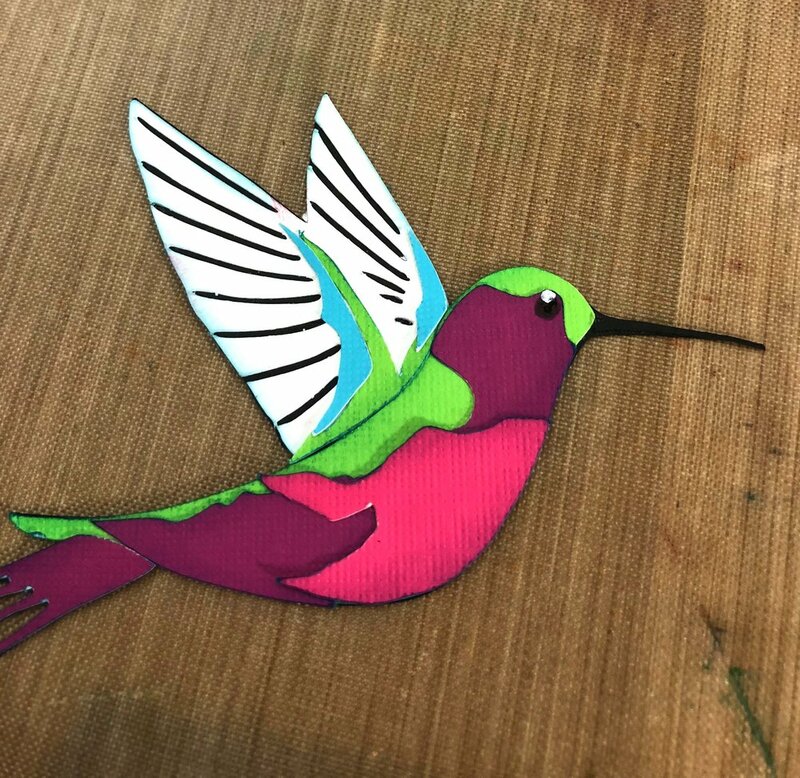 Because hummingbirds are so colorful I also inked up the edges of each piece before I glued them down. 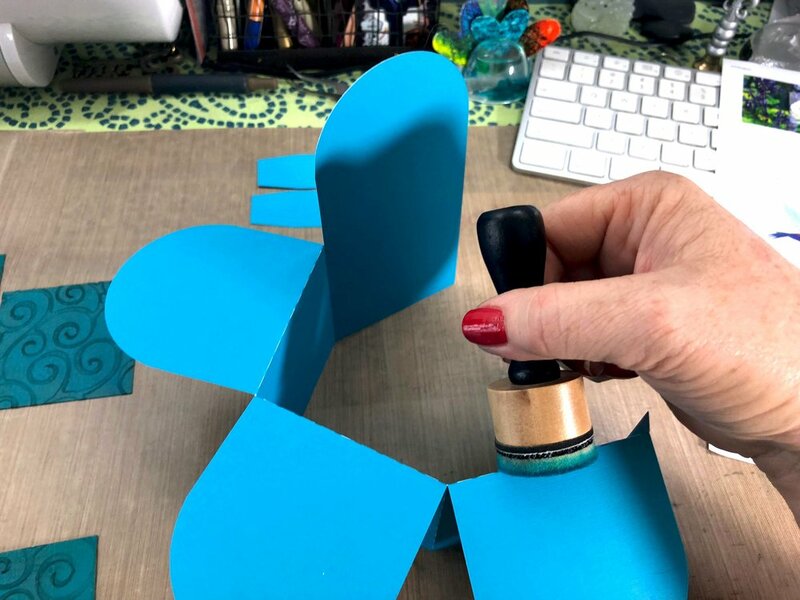 Just remember, if you are using Distress Ink like I am, you need to be careful not to smear the ink when gluing the pieces down since distress ink is reactivated when it comes in contact with anything liquid. Eventually I plan to collect a bunch of colors of Colorbox cat eye ink pads. They don’t run and the shape is very easy to work with on small pieces. Once you have the wings and the main body glued down, you can add the detail pieces to the wings. If you start with the green piece and line it up alongside the back of the bird body, it will help you align the next two blue pieces. You can play with this placement a bit, and it’s very forgiving, but this is the idea. Next, I glued the purple pieces. Another option here is to glue the purple tail piece before you glue the green main body down. But I think this works fine as well. I would suggest you play around with the layout of all the pieces first to see how it changes the look of it. The pink layer is also optional but I like it so this is approximately where it goes. The eye is added with black marker - I used my Stabilo pen for this one - and all you do is add it to the top curve of the purple layer. Then, for a little more detail, I like to add a white top layer with my uni-ball Signo white pen. I added this just above and slightly over the black eyeball. To give the beak a little more stability, I added another layer to it. Now to start putting it all together! I started with the inside back layer of the card before I added the inside panels. This is just because it’s easier to access the back before the other layers are in your way. 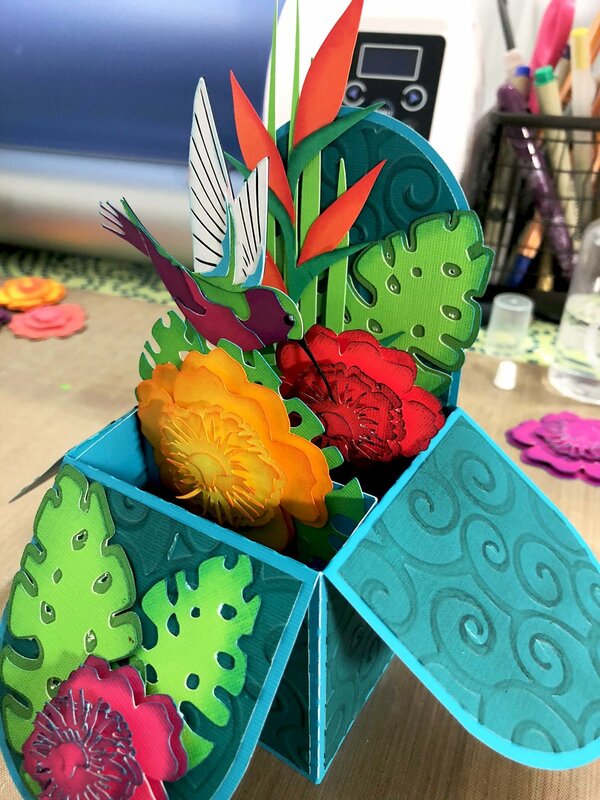 You can glue your flowers, leaves and hummingbird to the inside panels before you put the panels in if you know for sure exactly how and where to place them. Since I wasn’t sure, I glued the inside panels in place first. This is where I got distracted with the layout design and forgot to photograph each layer. Basically, I just kept playing around with colors and positions until I liked it. Then I used 3D adhesive squares for dimension when needed. For this card, it was especially useful to use 3D squares to attach the hummingbird to the leave behind it. This left enough space to insert the red hibiscus in between the layers so it looks like the hummingbird is drinking from the hibiscus. That’s basically it for now! I’d like to design another tropical flower that is less detailed and smaller for future cards but this one has been tons of fun! I hope you have enjoyed this tutorial and it has given you some creative inspiration. Please let me know if you have any questions.